↑ "BBC Full Financial Statements 2013/14" (PDF). BBC Annual Report and Accounts 2013/14. BBC. July 2014. p. 37. 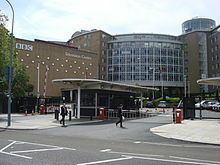 ↑ "BBC: World's largest broadcaster & Most trusted media brand". Media Newsline. Archived from the original on |archive-url= requires |archive-date= (help). ↑ "Digital licence". Prospect. Archived from the original on |archive-url= requires |archive-date= (help). ↑ "About the BBC – What is the BBC". BBC Online. Archived from the original on 16 January 2010. ↑ "BBC Annual report 2013/14" (PDF). BBC. ವಿಕಿಮೀಡಿಯ ಕಣಜದಲ್ಲಿ BBC ವಿಷಯಕ್ಕೆ ಸಂಬಂಧಿಸಿದ ಮಾಧ್ಯಮಗಳಿವೆ . ಈ ಪುಟವನ್ನು ೨೧ ಜುಲೈ ೨೦೧೭, ೧೬:೫೩ ರಂದು ಕೊನೆಯಾಗಿ ಸಂಪಾದಿಸಲಾಯಿತು.